Once the mouth-watering smells [and the timer] said they had cooked enough, I pulled them out to find a pool of tawny juices lurking in the bottom of the pan. Not wanting them to go to waste, I went to reach for a container to pour them into when a light bulb flickered in the dim interior of my mind… This would be fantastic to cook up some onions in, like those Harmony Burgers [ARCHON] has mentioned here, but with an Asian Flair to them. Be still my growling stomach! Onions, juices, pan, heat and it looked good already, but that bulb went off in that dim brain of mine once again and suddenly a secret ingredient was added to the pan – Pickled Ginger! Wait! What do you mean not everyone keeps a jar of pickled ginger in their fridge? No worries, I’ve added a substitute recipe for that too. I lost track of time as I nibbled one of the finished patties, warm off the pan, while I tossed the onions around and worked at getting them cooked up right. Soon the juices from the pan and the onions created a nice caramelization, they were declared done and ready to taste test. My mouth was saying they had turned out mighty good for a slap-dash-into-the-pan idea, so I dished out another patty and tried the two of them together, in a word, yum; just yum. Once again I was excited how a glimmer of an idea had turned out into a fantastic food idea. Notes were transcribed to the computer before my scribbles turned into untranslatable squiggles and I started making notes at the bottom of the digital copy with an idea for making the onions if you decided to grill the burgers and didn’t have the juices. Since there were not enough onions to go around for those remaining, I set out another night to test my noted ideas. A fine set of ideas they were too! Wandering back to the computer to make a few minor adjustments and what do you know here was a full service recipe is born and ready to share. 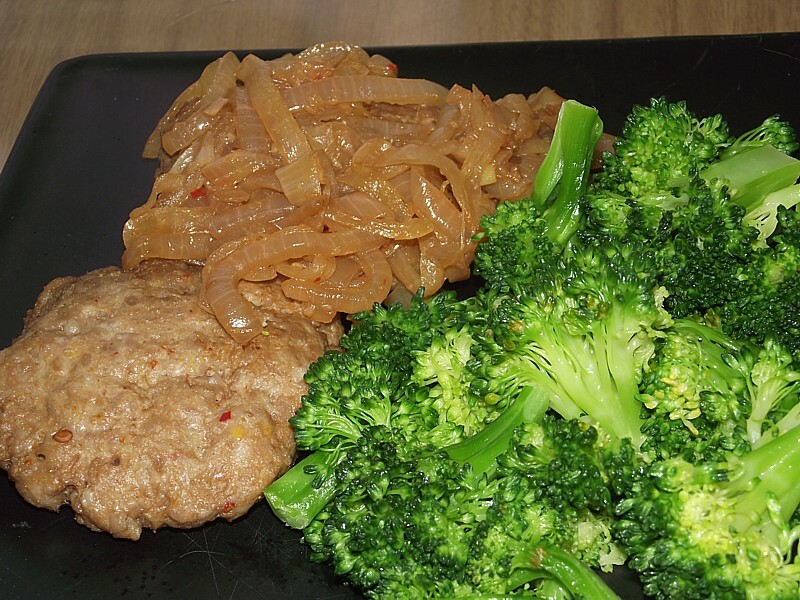 Serve these Orient-inspired burgers topped with the Ginger Caramelized Onions listed below on sesame buns with a side of stir-fried veggies or a nice salad. Mix & mash all ingredients together in a bowl until well mixed, cover and place in refrigerator for at least one hour. Take out and divide into 12 equal balls and form each into a patty. Place patties in a flat baking pan with sides and bake at 350°F for 25 minutes. Remove pan from oven, move patties to a platter and reserve juices for the caramelized onions. Re-heat the patties under the broiler or throw them on the Grill/BBQ to really give them some flavour! The perfect accompaniment to the Asian Flair Burgers, these onions borrow the flavour from the juices left from the burgers to create a unique version of an old classic. Cut each onion in half and thinly slice each half. In a frying pan on medium-low heat, carefully pour in juices, add pickled ginger and onions. Gently break onions apart and stir until ginger is well incorporated. Cook for approximately 25-30 minutes, stirring regularly until onions turn translucent and the sauce thickens. Add salt & pepper to taste, serve as desired. ** If you want the special onions and don’t have reserved juices, here is a substitute recipe. Using this version of the onion recipe might require longer cooking time [approx. 45 minutes] to get the sugars in the sauce and onions to caramelize properly. No pickled ginger? Put 3 tsp regular minced/finely chopped ginger in a small bowl, add ½ tsp sugar and 1 tsp rice or white vinegar and let sit for ½ hour before adding to recipe.